There is a 10 ticket limit per customer. 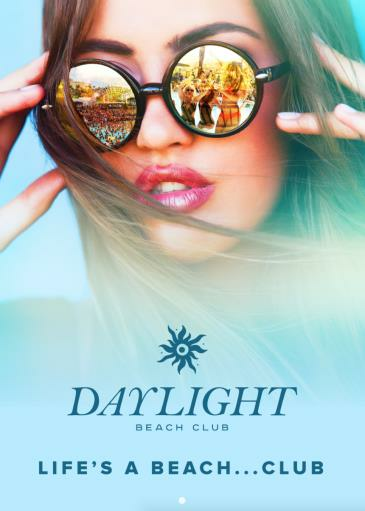 DAYLIGHT Beach Club door and management reserves all rights to decline entry of any guest not in proper dress code. DAYLIGHT Beach Club reserves the right to decline entry due to capacity issues, in which event guests will be asked to wait until the door is re-opened. Visibly intoxicated guests will not be admitted to the venue. No minors will be admitted. Guests must bring a printed copy of the scannable DAYLIGHT ticket (printed, PDF or on the Wantickets app), valid photo I.D., and the credit card the ticket was purchased with. Please bring these items to the Will Call area, adjacent to the entrance of DAYLIGHT and you will be scanned in. You MUST arrive by 12:30pm to guarantee entry. All DAYLIGHT patrons must be 21 years of age with valid ID. US residents must bring state or federal issued ID. Foreign residents must have passports. DRESS CODEUpscale stylish swim attire. No sports attire/athletic wear, torn or cut-off clothing, offensive prints, see-through clothing, chains, baggy clothing, hard soled shoes boots.